Chapel Down Winery sits just a few miles outside of Tenterden. California Girl and I did a tasting at Chapel Down during our recent visit to Rye. The tasting room is a small bar tucked away in the corner of a large barn that is focused on retail; for the wine and other local products. It seems that tasting is not as much of a focus here as it is back in Napa. 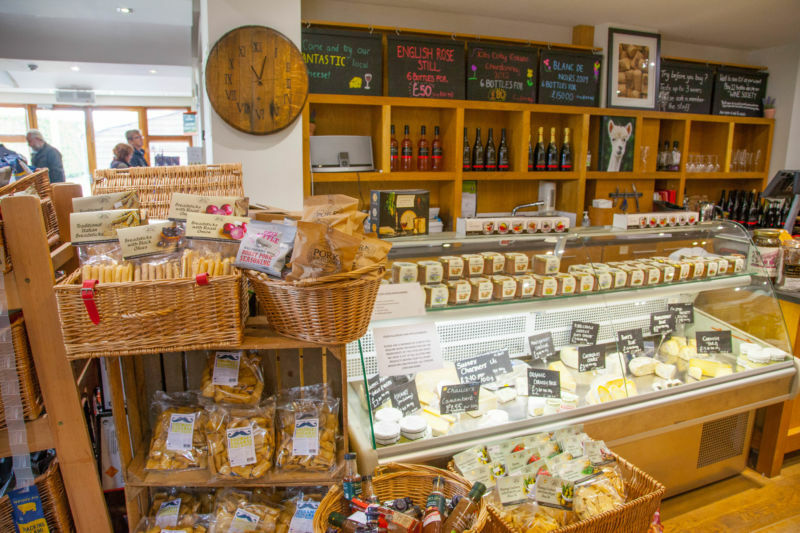 California Girl comments: I was really impressed with the way this winery is capitalizing on their tourism by selling local cheeses and gourmet treats to their visitors. It was a lovely array of products. The English climate means that what thrives are those grapes that prefer cooler growing seasons; so lots of Pinot Noir and Chardonnay, but no Zinfandel or Cabernet Sauvignon. 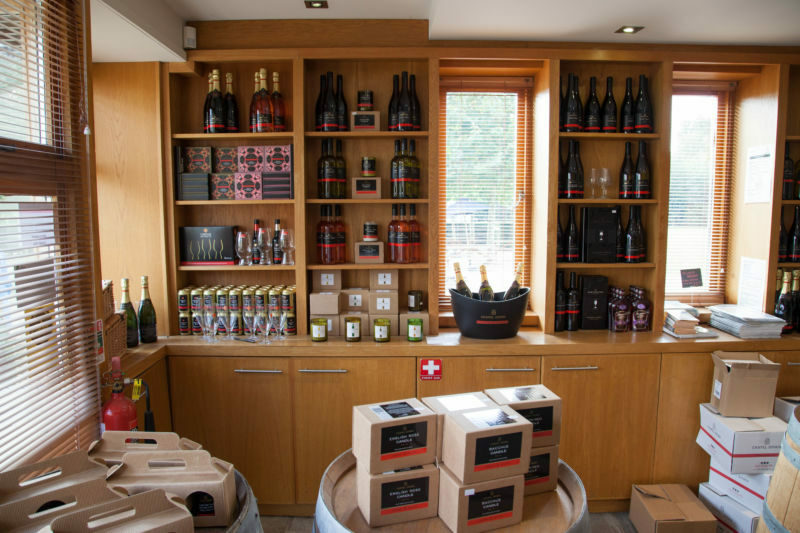 Chapel Down offers a free tasting of up to three wines. We undertook a more extensive tasting with our host Robert. 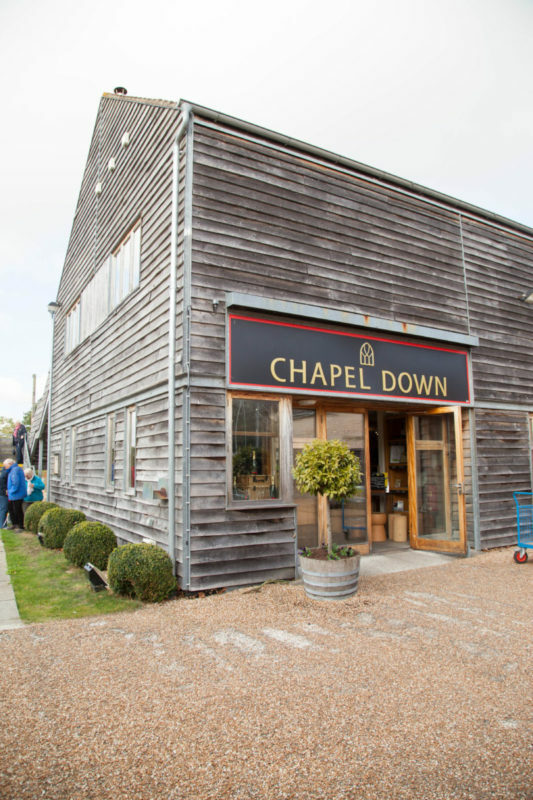 Chapel Down also have a tour and tasting. This event lasts for about 1 hour 45 minutes and costs £10. California Girl comments: Robert was both hospitable and knowledgeable about the wines he poured. It was interesting to talk with him about the terroir of the land and his thoughts on the up and coming British wine scene. Chapel Down source grapes from several vineyards across Kent; producing about one million bottles per year. They have twenty-three acres on the estate on which the tasting room is based. California Girl comments: Wow 1 million bottles a year. This vineyard produces more wine than many of the vineyards in Napa. I thought that was amazing. We started with the 2015 Bacchus which sells for £15.99 ($20) The Bacchus grape is a German grape that is the result of a cross between Riesling and Müller-Thurgau. The nose offered a mix of pineapple and peach. It offered a crisp acidity, with hints of gooseberry and orange. California Girl comments: This wine was extremely sharp and acidic on the palate. When you taste through all of the wines in the line up you will see that this winemaker has a definite style. All of the wines have strong flavors of citrus fruits, high acidity and fairly long on the finish. There isn’t much balance between fruit and acidity. Next up was the 2014 Bacchus Reserve; £13.99 ($17.50). As the name suggested the grapes for this wine came from the main Chapel Down estate. Unlike the previous wine, this undergoes malolactic fermentation. After a swirl, the nose opened up to offer a strong blast of lemon with a backing of wet-grass. The medium to high acidity was backed up with sharp flavours of apple and grapefruit. There was a long finish on the wine, but on balance I preferred the previous expression of this grape. Our third wine was the 2012 Chardonnay which retails at £13.99 ($17.50). I was greeted with a nose that mixed hints of kiwi-fruit with a rich apple fragrance. The wine had a light taste that did linger well on the palate with elderflower, melon, and a hint of chalkiness; an end-result very different from typical Californian Chardonnay. The penultimate of the still white wines, Kit’s Coty Estate 2012 Chardonnay (£16.99 ($21.25)) we tasted was my favourite. It is grown on chalk that is the same soil in which Chardonnay grapes are grown in the Champagne region of France. The vineyard is on a South-West facing slope that is a sun trap and is protected from the cold winds that blow off the North Sea. The wine is fifty-percent wild-fermented; a process by which only the naturally occurring yeast on the grapes is used. The wine spent nine months in oak and underwent malolactic fermentation. The resulting wine offered a complex nose of honeysuckle, apple, and melon. The acidity was lower than then earlier wines and led to a long taste of butter, vanilla, and lime. California Girl comments: I liked this wine. It was the most balanced of the whites we were offered. I think as the vineyard and the winemaker develops it will produce really great wines. We finished the still white-wine tasting with the 2014 Pinot Blanc. This sold at £13.99. It was extremely pale in colour and the nose was a mix of citrus, apricot, and hazelnut. The low to medium acidity complemented a slightly sweet mouth with cream, banana, melon, and apple. Next up on our extended tasting was English Rose, which was priced at £10.99 ($13.75). This wine is a four way mix of Pinot Noir, Pinot Meunier, Rondo, and Regent. The nose was of strawberries with a light suggestion of apple. 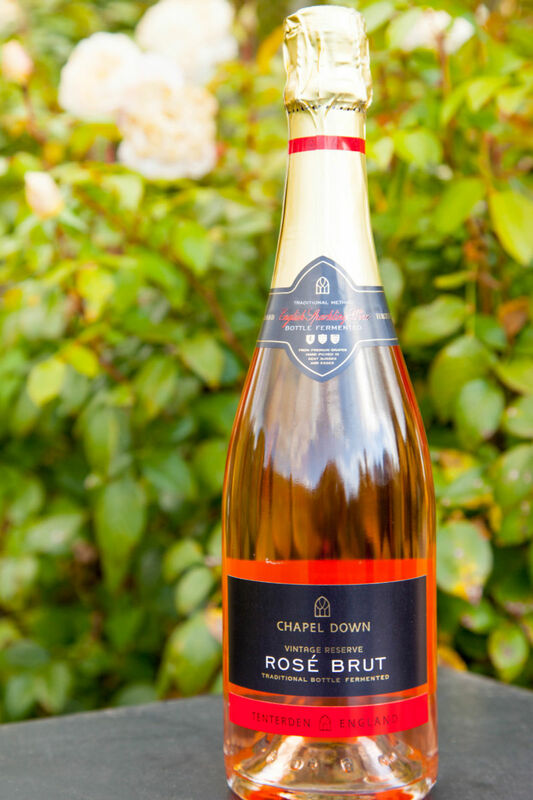 The medium plus acidity combined with flavours of strawberries, raspberries, and cream to offer a crisp summer time drink; for those few days of an English Summer that are warm and sunny. The first of the Sparkling wines is the Vintage Reserve Brut. It sells for £21.99 ($27.50) and despite the name is a non-vintage wine. There was medium acidity, just a little yeast that combined with cream and melon to make an easy drinking glass of sparkling wine. California Girl comments: I am not a huge fan of the Royalty here in the UK, but I know many of you are. I have to say that I would happily drink this sparkling wine for any occasion. It was my absolute favorite sip of the day. Now we moved to vintage sparkling wines; starting with the 2009 Blanc de Noirs; mixing Pinot Noir and Pinot Meunier. I was immediately struck by the rich golden colour. Inhaling the scent gave me a mix of rich fruit and toasted apple. Tasting the wine revealed one that was closer to sec than brut, with a fine balance of butter and apple. 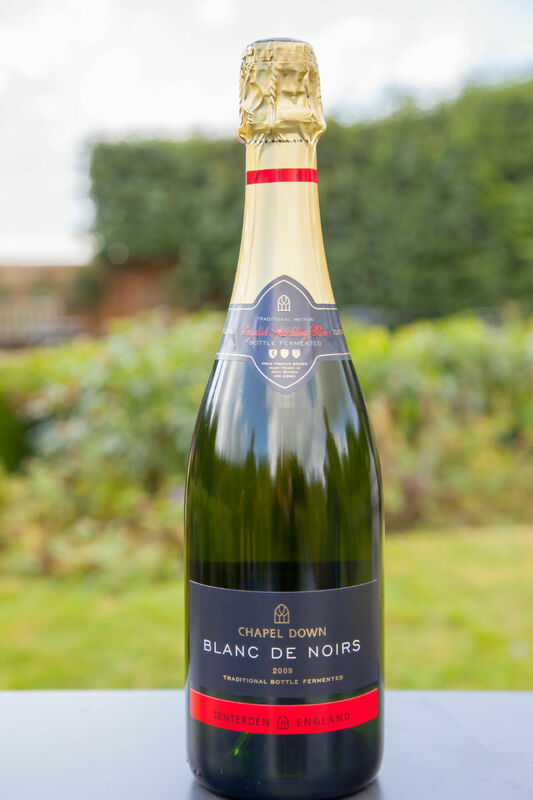 The next sparkling wine we tried was the 2011 Blanc de Blancs, made with 100% Chardonnay. The asking price for this bottle was $29.99 ($37.50) The nose on this was melon and apple, whilst its taste profile was dry, with apples and bananas. 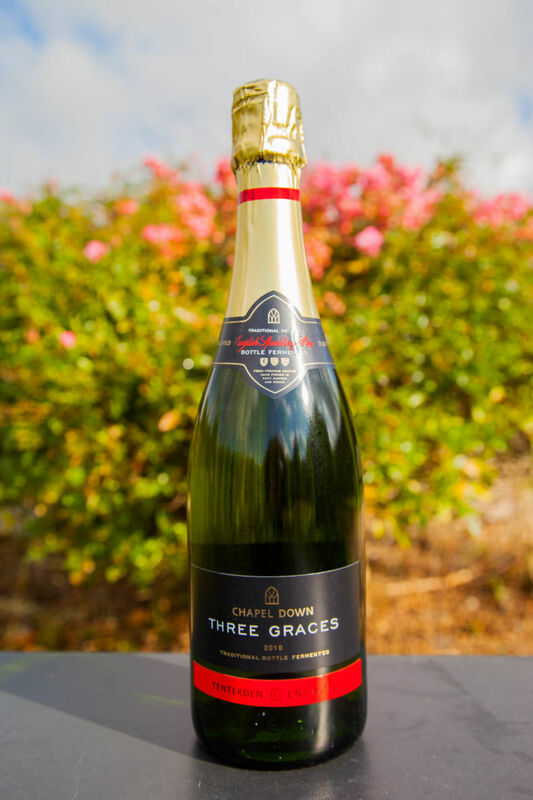 California Girl comments: The Three Graces was a nice sip. I liked its lively light bubble texture and the hint of cream on the palate. We finished with a couple of reds; the 2013 Pinot Noir and the 2014 Union Red. The latter wine is a blend of Pinot Noir, Pinot Noir Precoce, Rondo, and Dornfelder; I was familiar with only the first of these grapes. California Girl comments: This is where I feel this winery needs the most improvement. I thought the Pinot Noirs were not quite there yet, and didn’t really represent the grape well. The Pinot Noir was a very pale red, almost the shade of a rosé. The nose was subtle and offered plum. The taste was rather thin, but offered raspberry and wood. This sells for £13.99 ($17.50). This was my least favourite wine of the tasting. The Union Red retails at $11.99 ($15) a bottle. The nose that I detected was of smoke from a steam engine; an odour I love and had reveled in just the day before at the Romney, Hythe, and Dymchurch Railway. The flavour was subtle, with low tannins, a moderate mix of assorted fruits with raspberries to the fore. Overall, I enjoyed tasting English wines. The standouts were the sparkling wines, but I felt that the Kit’s Coty Chardonnay was worthy of note. The experience was undoubtedly enhanced by our friendly and knowledgeable host; Robert. California Girl comments: It was a really interesting day, and I enjoyed experiencing these wines. I’d love to come back in the future to see how the winery develops and matures. It’s been fun following your trip – keep the posts coming. I’m impressed you are staying current. I hope we can do that on our upcoming Europe trip. I am also loving hearing about the England wine scene. I live in England in the 70’s as a kid and the wine scene was virtually non-existent. I thought it was a joke when I heard about English wines last year but I have learned that they are up and coming for sure. The wine scene is growing here! It has a way to go before I would say France or Napa has anything to worry about. Still it was truly fun and interesting to check it out. 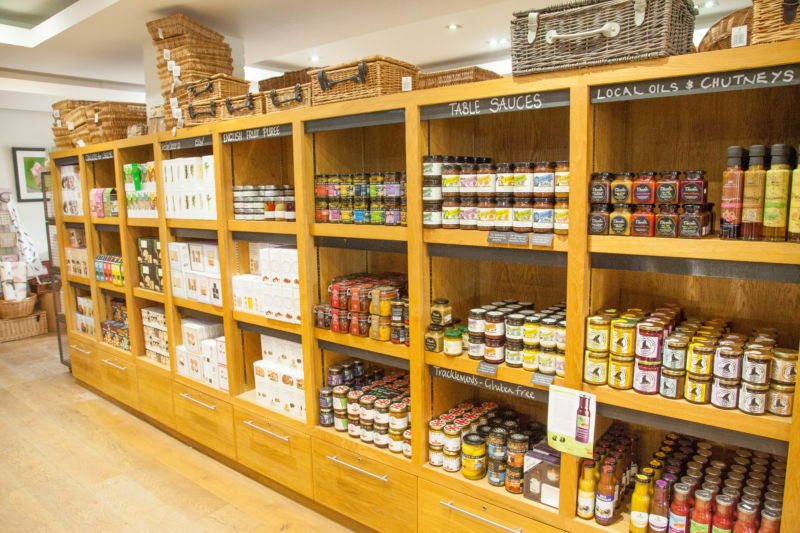 The Brits consume a lot of wine so I can really see there being a market for home grown products. Re: the electiom…people have been stopping me in the streets and asking me about my vote! Yesterday was even worse. People at breakfast in the hotel dining room. All attention was on me! Really uncomfortable I can tell you.